The Patriots celebrate following their victory in the 7A-1 regional championship. The Pace Patriots are state-bound once again. One of the most successful programs in the northwestern part of Florida is still alive and marching forward in pursuit of 2018 glory, as Pace defeated the Creekside Knights 3-2 in Tuesday’s Class 7A-1 Regional Championship to earn a berth in the state Final Four. The program will be seeking its fifth state championship in program history when it takes the field at Hammond Stadium in Fort Myers in next week’s Class 7A state semifinal, against an opponent yet to be determined. 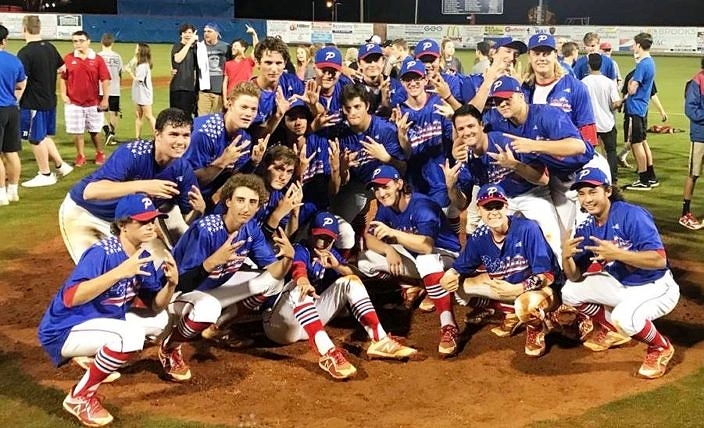 Although winning a regional title serves the larger purpose of earning a berth in the Final Four, Tuesday’s title game will go down as one for the ages thanks to the Patriots’ pitching. Starter Brandon Sproat and reliever Christian McCullough combined to throw a no-hitter. Sproat did not allow any hits in his five innings of work, before turning things over to McCullough with the score tied. McCullough allowed just one base runner, after hitting a batter with a pitch, and he earned the win when the Patriots (23-6) tallied the deciding run in the bottom of the sixth. The Knights (21-7) managed enough base runners to score a pair of runs against the starter, as Sproat walked three and also hit two batters. But the offense answered back as Izzy Ham reached on a fielder’s choice and was replaced by courtesy-runner Parker Tubbs. Bradley Taylor then walked, and Creekside elected to intentionally walk Bennett Shell for the third time, loading up the bases to set up a force play at any base. But a bases-loaded walk to JC Preacher caused that plan to backfire, as the deciding run crossed the plate uncontested. Shell also had an RBI single and Aidan Gilroy walked and scored to account for Pace’s other two runs.